Back to Los eBay Deals, where Adorama’s eBay store is offering the new condition GoPro HERO4 Silver, model CHDHY401, for $350 with free shipping, with a limit of five per customer. As with all featured eBay Deals, these are limited time offers with unpredictable expiration times. The Lowepro Stealth Reporter D200 AW Shoulder Bag is currently on sale for $40 with free shipping at B&H Photo. This is a regular sale, not their deal du jour. More terabyte action at the eBay Deals, this time it is the eBay store of Buy.com (now Rakuten) offering the new condition 5TB Seagate Expansion USB 3.0 Desktop External Hard Drive for $130 with free shipping, with a limit of five per buyer. This daily deal expired… The B&H Photo Deal of the Day ending by 11:59pm ET on Tuesday is the ikan Tilta ES-T07 Blackmagic Cinema Camera Rig for $500 with free shipping. The 128GB Lexar Platinum II 200x SDXC memory card is currently going for $50 with free shipping, with no purchase quantity limits at Amazon by Amazon itself. This is model LSD128BBNL200. Meanwhile the 64GB version of this is going for $25 with free shipping by Beach Camera on eBay. Speaking of eBay, a $200 plastic Sears gift card is offered for $175 with free shipping by Gift Card Mall’s eBay Store (limit 1). 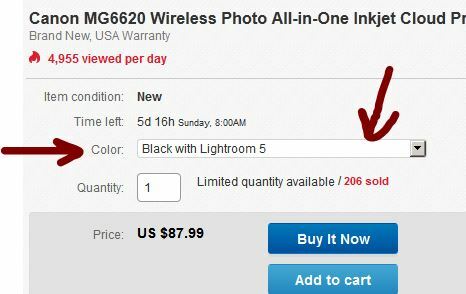 In addition to Sears, many other camera retailers sell thru the Sears website (similar to what they do at Amazon, eBay, etc). Speaking of Amazon, starting at 4pm ET on Monday, there is going to be a lightning deal on this Orbo NR22 Extreme Sports Action Camera. The price before the sale is $55. Speaking of speaking of Amazon, good for Monday only, they discounted the 8.9″ Fire HDX tablet (64GB storage option only) for $300, limit five per customer. The Pelican 1510-004-110 Case with Padded Dividers is on sale for $175 with free shipping and it is ships in “easy to open packaging” (formerly frustration-free packaging) at Amazon by Amazon itself with a limit of three per customer during this sale. If you want more than three, a marketplace seller (Norman Camera) offers it there for the same price. The Nikon Coolpix P530 superzoom (42x optical) is available as manufacturer refurbished for $200 with free shipping by Beach Camera at Amazon. This ships from Beach Camera, so it is not eligible for Prime shipping benefits. Poll: Are You Interested in Imported (Gray Market) Camera Gear? We have an opinion poll for you to help us prioritize future posts. Are You Interested in Imported (Gray Market) Camera Gear? The poll has three options. If you have a longer opinion or different answer, please feel free to leave a comment or use the online contact form. Are you interested in Import (Gray Market) Camera Gear? This daily deal expired… The B&H Photo Deal of the Day ending by 11:59pm ET on Monday 2/9/15 is the Genaray LED-6200T 144 LED Variable-Color On-Camera Light offered for $80 with free shipping. The hard disk specials continue at the eBay Deals, this time NewEgg’s eBay store is offering the new condition 1.5TB Seagate 2.5″ Portable External Hard Drive, USB 3.0, model STBX150040, offered for $60 with free shipping, with a limit of five per buyer. DiscountMags has a Weekend Magazine Sale featuring 100 different magazines for $5 per year. Among them, four are photography magazines, Digital Photo Pro, Outdoor Photographer, Popular Photography and Digital Photo. The usual terms apply. You can subscribe for up to three years at the $5/year rate. The offer is good for new subscribers or renewals or gift subscriptions. All subscriptions from DiscountMags are without auto-renewal (they only renew if you personally renew them). US addresses only. No coupon code needed. The photography magazines are towards the bottom of the page (or use the “More” option in the grey menu at the top over there). Other semi-related magazines participating: Wired, Videomaker, Pop Sci, Discover, and various special-interest subjects with lots of photography (sports, nature, fashion, travel, etc). Offer ends at 11:59pm ET on Sunday 2/8/15. The new Canon 5DS DSLR duo is the biggest and most expensive new camera of 2015 so far. However, pre-orders are not accepted just yet. Amazon’s estimate says you will be able to pre-order it on 4/30/15. B&H Photo’s page estimates the camera will be available in June 2015. Adorama has a June estimate as well. Needless to say, this is too early, more details and more specifics will become available as we get closer to actual release. In a tech world of near-instant gratification, waiting for months before one can pre-order can feel a bit unusual. The new Canon D-Rebel T6s and T6i dSLRs already have pre-order deals. If you pre-order one of the Canon T6s kits or one of the Canon T6i kits, within 72 hours after shipment of the camera (shipment, not order), a $50 promotional credit will be automatically applied to your Amazon account. The promotional credit can only be used towards the purchase of these these accessories (16GB or 32GB or 64GB Sandisk Extreme SDHC, AmazonBasics camera bags and tripods). The terms and conditions over there have all the details. As usual, all eligible items must be sold and shipped by Amazon itself, not 3rd-party sellers. This daily deal expired… The Sellout Woot deal of the day ending by 1am ET on Sunday 2/8/15 is the open-box black Sony NEX-3NL/B with the 16-50mm lens for $250 plus $5 flat shipping, with a limit of three per customer. Canon is back with another serious SLR lens, the Canon EF 11-24mm f4L, with a pre-order price of $3000 at Adorama and B&H Photo and Amazon itself. The Nikon D5500 APS-C dSLR was announced at CES 2015 time, and a month later, all three official kits of the camera are in-stock and ready to ship. In fact, if you page down the various offerings at Adorama, they have bundles with free 32GB SD, camera holster case, lens filters, and cleaning kit for the same price as the standard kits. Some of the standard kits are also in-stock at BuyDig (free case, 16GB card, etc) and at B&H Photo (free shoulder bag, Watson battery, 16GB card) and at Amazon by Amazon itself (no freebies). Pre-order time for Olympus. They have revealed a brand new E-M-series cameras, the new E-M5 II body only with a 16mp LiveMOS sensor, 10fps, 3″ tilting LCD, dust/splash-proofness, and more. The starting price is $1100 and it is available for pre-order, in black or silver color-schemes, at Adorama and B&H Photo and Amazon itself. The E-M5 II also gets its very own underwater housing, model PT-EP13, with a pre-order price of $1000, and the HLD-8 Power Battery Holder with a pre-order price of $280. Also new is the M.Zuiko ED 14-150mm f4-5.6 II Lens, dust and splashproof, with a pre-order price of $600 at B&H Photo and Adorama. Also coming along for the ride is another waterproof P&S digital camera, the new Tough TG-860 with a pre-order price of $280. Action cameras and waterproof cameras are apparently surviving the onslaught of smartphones. Pentax wants to empty your K-wallet with just two lenses. Announced this week are two high-end lenses. First up, it is the 70-200mm f2.8 HD D FA* ED DC AW with a pre-order price of $2300 at Adorama and B&H Photo. Next up, it is the 150-450mm f4.5-5.6 HD D FA DC AW with a pre-order price of $2500 at Adorama and B&H Photo. Note: the “DC” in the model names is for the Direct Current (DC) autofocus motor, not to be confused with the Sigma-speak “DC” for APS-C lenses. It’s February and the new products are starting to roll out again. We start with the brand new Sekonic C-700 SpectroMaster Spectrometer and its parallel C-700R with wireless flash triggering. They are now available for pre-order for $1500 and $1700 respectively at B&H Photo. If you are looking for a “getting started with” Sony SLT APS-C dSLR bundle, the latest eBay Deals includes this new condition Sony a58 mega bundle. For $450, you get the new condition Sony a58 with 18-55 and 55-200, Lightroom 5, and a $50 VISA gift card. The gift card and LR5 are included in the bundle, they are not mail-in rebates. This is offered by Beach Camera on eBay, an authorized Sony dealer. The Amazon Lightning Deal expired, but if you are comfortable with refurbished, this eBay offer continues: for $400 you can get the manufacturer refurbished Sony NEX-5TL two-lens kit (16-50, 55-210) by Secondipity on eBay. The Canon G1x fixed lens camera with RAW and 1.5″ sensor is now down to $400 with free shipping at B&H Photo (with free accessories) and at Amazon by Amazon itself (limit 2). The last time we mentioned the Panasonic GF6 with 14-42mm it was going for $350. As of this recheck, it has dripped down to $330 with free shipping by Roberts LP fulfilled by Amazon with a limit of two per customer. The side effects of camera gear addiction include camera bag addiction. Which brings us to the Lowepro Pro Roller Attache X50 Case, model LP36265-PAM, on sale at the moment for $100 with free expedited shipping at B&H Photo. This is a stand-alone sale, it is not their deal of the day. To the land of the eBay Deals we return where Adorama’s own eBay store is offering the manufacturer refurbished Nikon D3100 w/18-55 and 55-200 two lens kit for $300 with free shipping with a limit of five per customer and a 90 day Nikon warranty. Please note these are non-VR lens (not stabilized). Panasonic has launched another round of Instant Savings (aka Discounts) on a dozen of their micro-four-thirds lenses, you can find them nicely organized at B&H Photo. PS: I can’t always check the daily deals exactly when they go live, but you don’t have to wait for me. You can use the handy “DAILY DEALS LINKS” in the Sidebar of this blog. This daily deal expired… The latest B&H Photo Deal of the Day ending by 11:59pm ET on Wednesday is the Impact Soft and Natural 4 Socket 3 Light Kit for $200 with free expedited shipping. This bundle includes a lot of items, so the free expedited shipping is a big plus. As of a 2/6/15 recheck, the price increased to $130… The current eBay Deals featured deal counters the RAW and megapixel explosion with a 4TB SAMSUNG D3 Station 3.5″ Desktop External Hard Drive, USB 3.0, model STSHX-D401TDB, offered for $100 with free shipping by NewEgg’s eBay store with a limit of five per customer. As of the time of writing, over 2300 units sold. I suspect this may not last long (but this is only a guess). Monoprice has a new coupon, use code FEB20 to get $20 off a purchase of $100 or more at the Monoprice website. Coupon expires at 11:59pm pacific on Tuesday 2/3/15. One use per customer. Excluded are Tamron lenses, Yamaha, Origin, 3D Printer, Xbox and Playstation. Cannot be combined with other offers. Monoprice has a lot of camera and photo accessories at reasonable prices, with the $20 off coupon making them an even better bang for the buck. Amazon has a new Creative Cloud Promo credit promotion for February 2015. You will receive a $75 Amazon promotional credit by email if you sign up for a 12-month $50/month Creative Cloud Digital Membership plan. You need to link your Adobe account (existing or new one) when you purchase this. You get a full refund if you cancel within 30 days. If you cancel after the 30 days, there is a 50% cancellation fee of the remaining commitment. Amazon will send the email with the promotional code by April 7 in 2015. Offer ends 2/28/15. This offer is good only if you qualify for the Adobe Student & Teacher discounts, per Adobe’s guidelines of what qualifies. You will receive a $25 Amazon promotional credit by email if you sign up for a 12-month $25/month Creative Cloud Student and Teacher Edition Membership plan. You need to link your Adobe account (existing or new one) when you purchase this. You get a full refund if you cancel within 30 days. If you cancel after the 30 days, there is a 50% cancellation fee of the remaining commitment. Amazon will send the email with the promotional code by April 7 in 2015. Offer ends 2/28/15. Click on the “Read More” of each course at the Stacksocial listing for more details. The Sony a77 II body SLT-dSLR is now down $50 to $950 in the body only configuration at Amazon by Amazon itself and B&H Photo and Adorama and BuyDig.com and other authorized dealers. The various others a77 ii kits with various lenses are also adjusted accordingly.